Originally built as a Hindu Temple by the Khmer Empire, Angkor Wat is the largest religious monument in the world. The complex measures a massive 401 acres (1,626,000,000 square meters) and was built to honor the Hindu deity Vishnu. 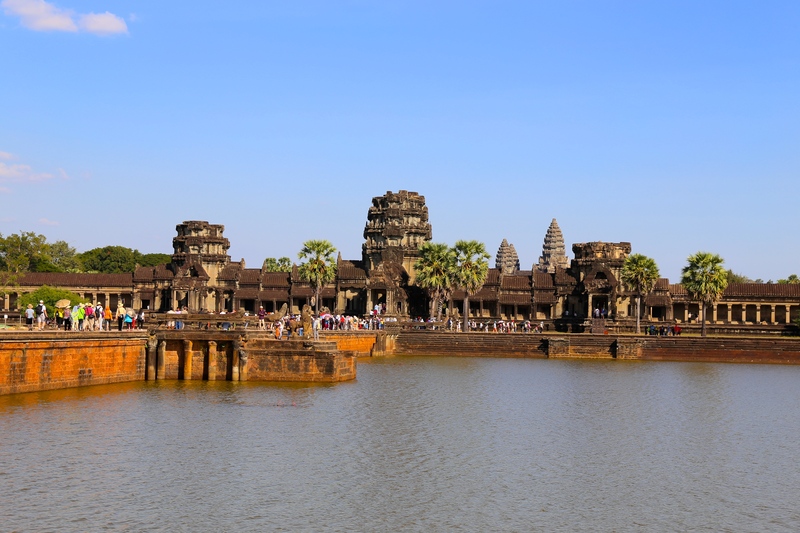 Construction of some of the monuments here is thought to have begun as early as 900 AD and majority of the temple complex was built by Khmer King Suryavarman II between 1113–1150 AD. It was designed to resemble Mount Meru, which, in Hindu mythology, is the home to the Hindu deities. Later in the 12th century, the temple gradually transformed into a Buddhist temple and Buddhist monks still visit Angkor Wat today. The Angkorian period lasted from 802 AD until the 14th century. The population in the city of Angkor was significant- it accounted for 0.1% of the world’s population in the 12th century. The massive abandonment of Angkor city which housed Angkor Wat, occurred when the Thai kingdom of Ayutthaya took Angkor in 1431. 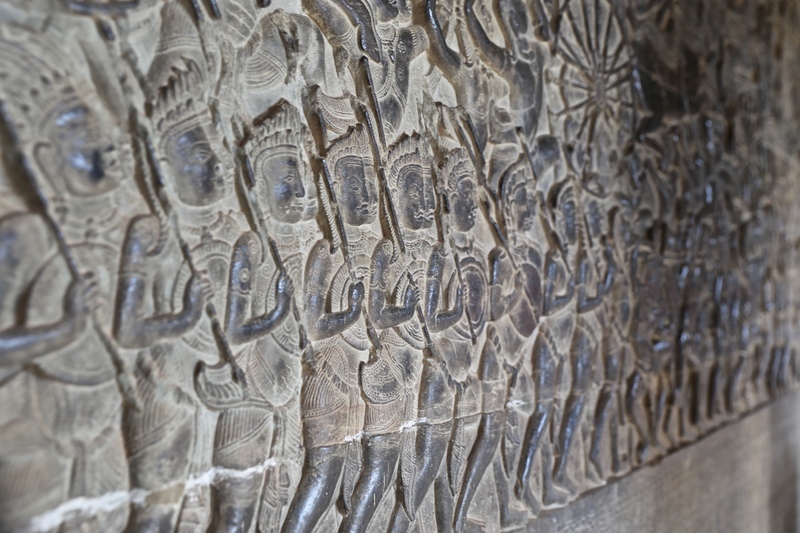 This led to a massive migration south and marked the end of the Khmer empire. 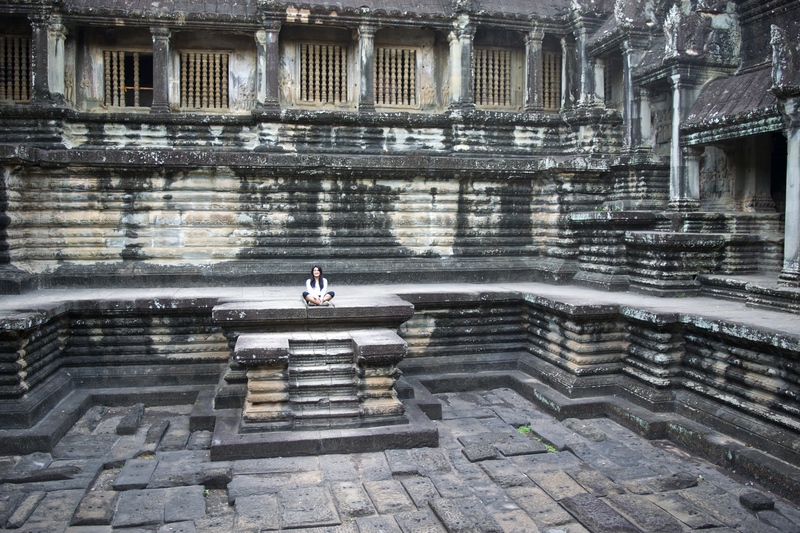 Angkor Wat was not discovered because it was never lost. The location and temples of Angkor have been described in history on several accounts following the fall of Angkor in the 1400s. However it was Henri Mouhot who popularized this world wonder. In 1858, Mouhot arrived in southeast Asia and spent the next three years exploring, until his death in Laos at the age of 35 from malaria. Little did he know that two years after his death, in 1863, the publication of his travel journal would immortalize him. In his journal, he described the massive lost city complex of Angkor and all its grand temples that had been consumed by the jungle. 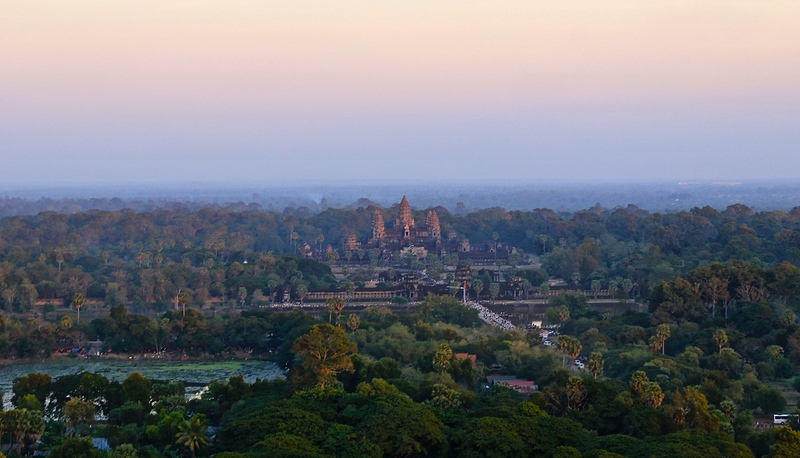 It is thought that Angkor Wat was largely preserved from this due to the large moat that surrounds the temple complex. The nearby Ta Prohm temple (the site of the Lara Croft: Tomb Raider movie filming) has trees that have grown into and out of the temple structures. 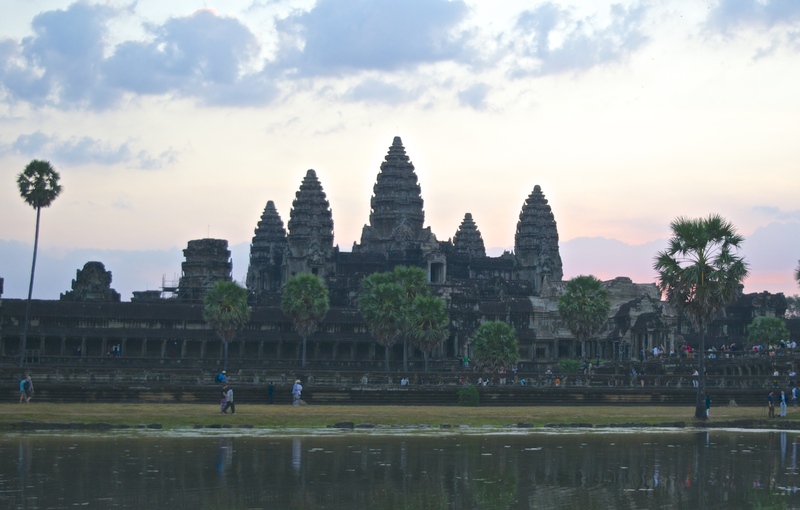 Direct flights to Siem Reap (Siem Reap airport code: REP) can be found on local asian carries from several cities including Bangkok, Hong Kong, Shangai, and Guangzhou. From Siem Reap, Angkor Wat is a short drive away. Much of Siem Reap’s hotels cater towards travelers planning to visit the temples, so once you book a hotel in Siem Reap, you can arrange a tour through them as well. Flights are also available from Cambodia’s capital city Phnom Penh and the beach town of Sihanoukville, if you plan to visit Otres Beach after temple touring. Buses are also available to take in Cambodia, but flights are the fastest and most reliable option. 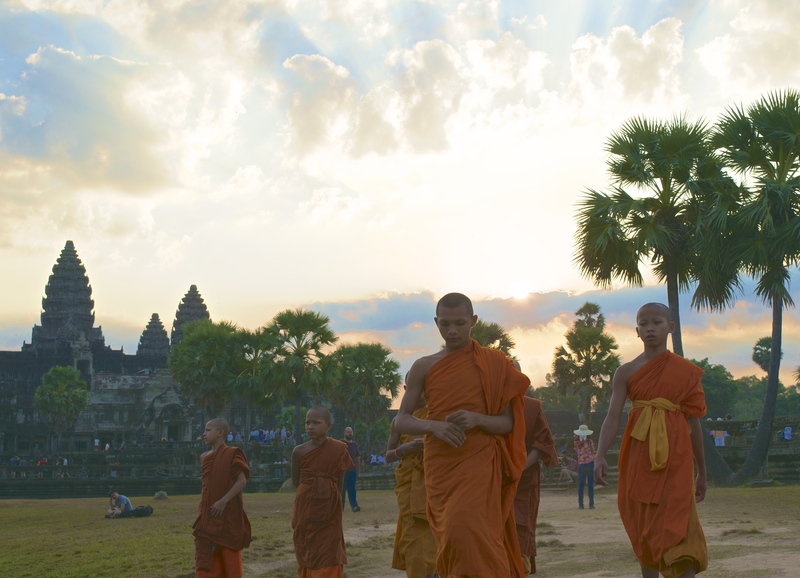 Although Cambodia’s weather can be very hot and humid, remember to cover knees and shoulders when visiting the temples. Given the thousands of visitors each day, you are unlikely to be stopped, but out of respect to the local monks, cover up appropriately. Make sure to bring a camera, bottled water, and buy your ticket ahead of time. If hiring a tour guide (highly recommended), they should be able to handle this for you. Bring cash to pay for food and souvenirs near the temple. Don’t forget to use insect repellant with deet while visiting Cambodia. Cambodia’s monsoon season runs from late May to November. To avoid rain, plan travel around those months. For budget travelers, room rates (which are already low in Siem Reap) can be a real bargain during the rainy season. The most expensive time to travel to Cambodia is around the Christmas and New Year holiday when hotel prices can be double and sometimes triple the normal rate. Plan in advance if traveling during the holiday as hotel rooms tend to fill up quickly. Leave early in the morning (at least one hour before sunrise) to get a good spot to view the sunrise. Crowds around the holiday season are massive. Both sunrise and sunset are beautiful at Angkor Wat. 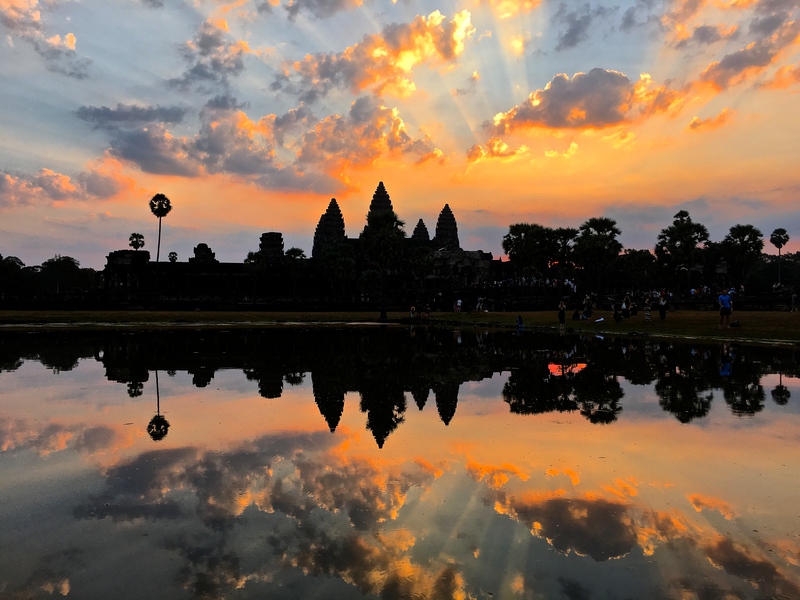 In the mornings, the sun will rise behind the temple causing a stunning reflection of the temple and clouds in the pool in front of Angkor Wat. For sunset, tethered hot air balloon rides cost only 20 USD and can give you an aerial view of the massive temple complex. In addition to Angkor Wat, be sure to visit the nearby Ta Prohm and Bayon temples. Ta Prohm is famous for massive tree roots that have grown into and around the temple structures. For a break from temple touring, take a direct flight from Siem Reap to Sihanoukville (airport code: KOS) to visit the peaceful Otres beach on Cambodia’s southwest shore. 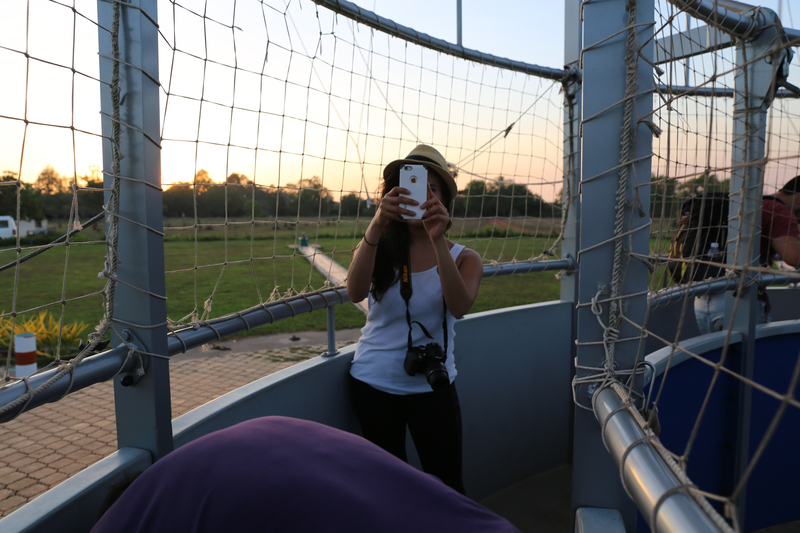 Me on the hot air ballon before sunset. You can never have too many cameras!